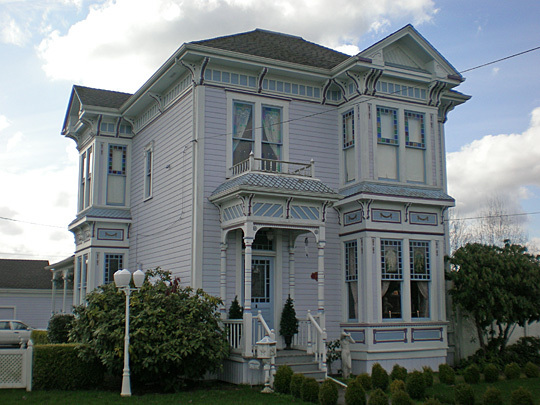 Sumner City Hall is located at 1104 Maple Street, Sumner, WA 98390; phone: 253-299-5501. Photo: The Herbert Williams House, 1711 Elm Street, Sumner, Washington. This house was built in 1890 by Herbert Williams for his wife Lola. Listed on the National Register of Historic Places in 1984. Photographed by Ben Cody (own work), 2008, [cc0-by-1.0 (creativecommons.org/publicdomain/zero/1.0/deed.en], via Wikimedia Commons, accessed October, 2012. Sumner was settled in 1853 by members of a wagon train which crossed over the mountains through the Naches Pass. In some places, it was necessary to lower the wagons over a cliff. Isaac Lemon and Addison Perham signed for donation land claims on September 20, 1853, followed by Charles Bitting, George D. Heyward, Abial Morrison, William M. Kincaid, Robert S. More, Jonathan W. McCarty, Thomas Owens and Abram Woolery. Other future residents of Sumner on that first wagon train were Isaac and James Woolery, John Van Ogle and Albert Lane. William Kincaid and his wife's family, the Woolerys, settled adjoining donation land claims (DLCs). In 1883, the town was platted on the 160 acre Kincaid Donation Land Claim by John and Nancy Kincaid and Lucy and George Ryan. In 1873 George Ryan came west from Baraboo, Wisconsin. He purchased 40 acres in Sumner from Main Street to Park Street from Laura Kincaid Seaman and then married his childhood sweetheart, Lucy V. Wood, in 1875 in San Francisco. Ryan farmed the 40 acres; raised fruit, vegetables and hops; owned a sawmill; built a big section of the business district; helped establish a railroad depot and was elected Sumner's first mayor in 1891. The village was first called Stuck Junction and later Franklin. A local resident, J.P. Stewart, was instrumental in establishing a post office serving the area now governed by Puyallup and Sumner, and he named the area Franklin after his hometown in New York State. When the nearby post office relocated, another one was needed in Sumner. The U.S. Postal Department requested a new name for the post office since there were so many places named Franklin and delivering mail became confusing. Three townsmen, John F. Kincaid, L.F. Thompson and George Ryan, could not agree on a name, so each placed a name on a slip of paper and put it into a hat. A boy was called into the store to pick one of the slips, and it came out "Sumner." Charles Sumner, a senator from Massachusetts and a popular statesman of the 19th century, was known for his efforts toward the abolition of slavery among other issues. The name of Sumner went on the railroad depot after the town incorporated in 1891. City of Sumner, Washington, A self-guided tour through the Historical Landmarks of Sumner, Washington, brochure, www.ci.sumner.wa.us, accessed October, 2012.